Home Land What are the challenges? The Texas Blackland Prairie ecoregion covers nearly 20,000 square miles and runs right through the Dallas-Fort Worth region. The Blackland Prairie is known for its rich soil, which has resulted in most of the grassland being converted to cropland. Large areas have also been developed, which is why less than 1% remains today, making it the most endangered large ecosystem in North America. There are very few Blackland Prairie areas left, and they only exist due to conservation efforts on managed land. 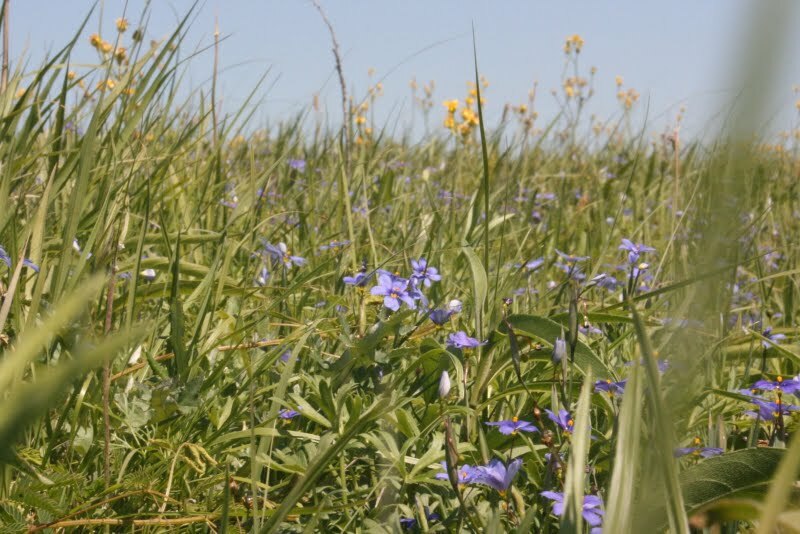 To learn more about Texas prairies, visit the Native Prairies Association of Texas. Pollinators – those bats, birds, insects, and other animals that help plants reproduce – are facing grave challenges. A lot of people know that bees are in trouble. Most of the media attention has focused on the European honeybee (what most people think of when they think of bees). While they are not native, they are extremely important for our food system – they pollinate over 90 commercial crops in the U.S., worth $15 billion annually. Unfortunately, the U.S. lost 42% of its honeybee colonies between April of 2014 and April of 2015 from Colony Collapse Disorder (CCD). 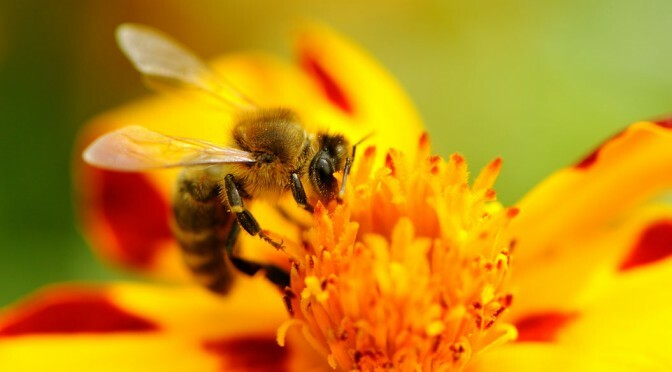 This is caused by a number of factors: exposure to numerous pesticides, mites, not enough variation in their diet, and stress from being moved across the country to pollinate crops. Our native bees, like bumble bees and mason bees, are being threatened by habitat loss. As wildflower fields, grasslands, and woodlands are converted for other uses, these pollinators lose their homes and food. The Monarch Butterfly population has also declined nearly 90% in recent years, largely due to habitat loss, primarily the loss of milkweed. 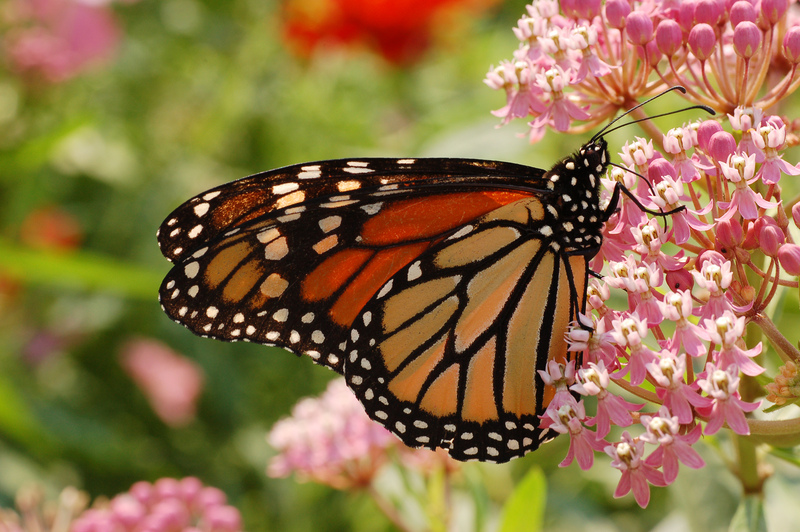 This flowering plant is the only place the Monarch will lay its eggs, and serves as virtually the only food source for Monarch larvae (caterpillars). Many wildflower areas across the country have been converted to cropland, leaving these butterflies with little food sources and breeding grounds as they complete their 2,000-mile migration. Have you ever driven with your windows down at night and noticed how cool it gets when you go from the city into rural areas? This is a phenomenon known as the urban heat island, which describes the relatively cool temperatures in rural areas compared to the city. On a hot day, you may have also noticed that it is much cooler if you are standing in a park than if you are standing in a parking lot. 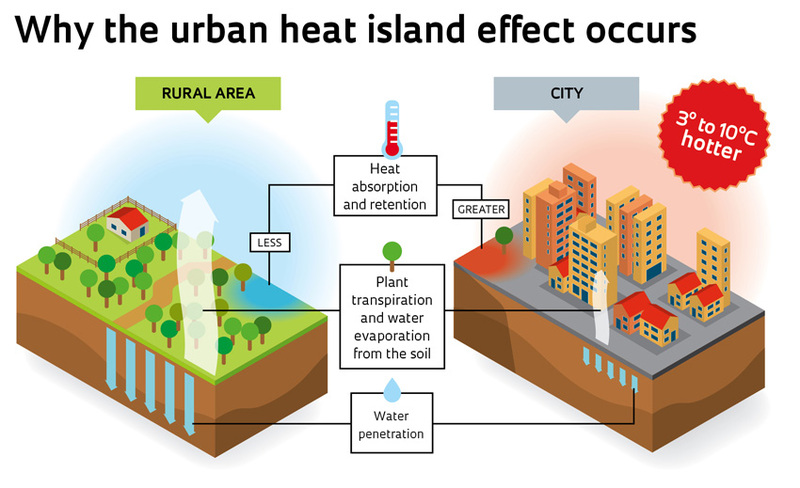 This is the urban heat island on a small scale, or a “micro-heat island”. This happens because urban surfaces – all of the concrete, asphalt, and building materials used in a city – absorb a lot more heat than grass and trees, and that heat radiates from these surfaces. On the other hand, as plants “breathe” (evapotranspirate), they release moisture into the air, which cools the area around them. The more urban surfaces there are, the hotter the heat island gets, which can pose a health threat to those living in the city, especially during heat waves. Urban surfaces also increase stormwater runoff and reduce water penetration into the soil (see the image above). Concrete and asphalt are impervious (not porous), so all of the extra water that falls in a heavy rain event goes into storm drains, where it runs directly into rivers and lakes. This can result in pollutants entering our waterways and erosion of river banks. If this land were covered in pervious materials, or better yet, grass and trees, much of the extra water could be absorbed. Tree roots are especially effective filtering pollutants and holding water in an area, which helps alleviate drought and reduces the urban heat island effect.